The streets of downtown Toronto are vibrant and busy at all times of the day. During the day business women rapidly click their heels and talk a mile a minute into their cellphones. Students hustle off to school, their backpacks swaying from side to side and men with ties and briefcases flood the subway. It’s hard to notice anything besides the flashes of colour that blur together in your peripherals. At night the streets are calmer – people walk more slowly and everything is in focus. The sides of the road are piled with garbage bags, full of coffee cups and plastic water bottles, waiting to be picked up and taken to the landfill. In between the bags lay the city’s homeless – wrapped up in sleeping bags, boxes and whatever else they have scrounged for warmth. Obviously, homelessness is an issue that occurs in every corner of the world. While many factors spark the problem, affordable housing shortages is one of the most significant. In Nigeria, Africa’s most populous nation, 16 million housing units are required to address the shortage problem, which would require a staggering cost. Luckily, Nigeria has found an inventive way to address the shortage problem, cut costs and help the environment – by building plastic bottle homes. In Nigeria, 16 million housing units are required to address the shortage problem. Recently they found an inventive way to address the shortage problem, cut costs and help the environment – by building plastic bottle homes. The two-bedroom bottle houses are built by filling the bottles with sand and then holding them together using mud and cement. This forms a solid wall that is stronger than cinder blocks. Additionally, the homes are bulletproof, fireproof and can withstand earthquakes – plus they hold a comfortable temperature year round. The buildings can be as high as three stories, but can go no higher due to the weight of the sand-filled bottles. Bottle caps of various colors protrude from the walls, giving each house a unique and bright look. 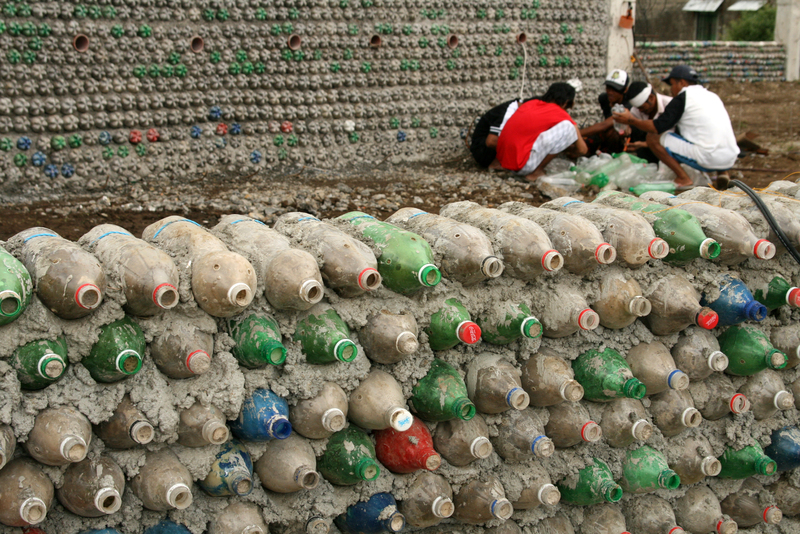 The two-bedroom bottle houses are built by filling the bottles with sand and then holding them together using mud and cement. This forms a solid wall that is stronger than cinder blocks. According to Phys.org, the project was first initiated by Kaduna-based NGO Development Association for Renewable Energies (DARE), with help from London-based NGO Africa Community Trust. The project is solving two problems at once by addressing homelessness, and helping the environment. Not only will there be less plastic in the landfill, but the house is designed to produce zero carbon emissions. It is completely powered by solar panels and methane gas from recycled human and animal waste. The project is solving two problems at once by addressing homelessness, and helping the environment. Not only will there be less plastic in the landfill, but the house is designed to produce zero carbon emissions. Plastic bottles take hundreds of years to biodegrade in landfills and Nigeria throws away three million bottles daily. A two-bedroom bottle house only requires 14,000 bottles to complete, meaning that there are enough supplies to meet the housing demand. Plastic houses are also cheap to construct – they cost a quarter of the money required to build a conventional house. Three million is a small number compared to the 130 million bottles that the United States uses per day. That’s 47 billion bottles per year – and at least 80 per cent of those end up in the landfill. According to Off Grid World, the United States throws away enough bottles to build 9,257 houses a day – that’s nearly 3.4 million houses a year. Interestingly, there are 3.5 million homeless people in the U.S., which means that the housing shortage could be met if the States would follow in Nigeria’s footsteps. The streets of downtown Toronto – and of any city – would transform with the elimination of homelessness and the plastic trash that litters the streets, sidewalks and gutters. Bottle houses are a positive step towards ridding the community of both problems. The idea has already succeeded in Nigeria, and could succeed in other places as well – providing the ultimate form of recycling.